The YAESU FTA-550 is packed with features, yet very affordable. Boasting an oversize full dot matrix LCD display, the FTA-550 Airband Transceiver provides full communication on the Aircraft communications Band and additionally provides VOR and ILS navigation features on the "NAV" band. The FTA-550 includes NOAA weather band monitoring and the capability of programming up to 200 memory channels with a quick and easy channel recall feature. The brand new easy to operate menu system is icon driven making it simple to navigate through all of the powerful features this transceiver has to offer. Additionally the FTA-550 can easily be reprogrammed in minutes using the optional PC Programming software and the supplied USB programming cable. Li-Ion battery, 110V and 12VDC charger with cradle, Alkaline battery tray, Antenna, Belt clip, headset adapter, and USB programming cable. Alkaline battery tray, 12VDC Power cable, Antenna, Belt clip, headset adapter, and USB programming cable. The FTA-550 has now been tested and complies with the Military Standard MIL-STD-810F. Similar to commercial Land Mobile radios, all current Yaesu Airband Transceivers have been tested for durability against Low temperatures, High temperatures, Shock, Vibration, Dust and Rain, ensuring many years of rugged use. 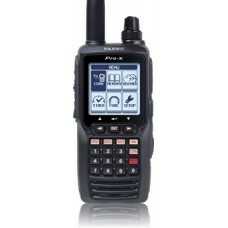 The FTA-550 comes configured with an easy to operate icon driven menu system. The displays and menu settings are logically configured for a more intuitive user interface. The FTA-550 features a huge 1.7" x 1.7" full dot matrix LCD display with full backlight and dimmer. The high resolution display makes it easier to view all the great features the FTA-550 has to offer. When the FTA-550 receives a VOR signal, the display will automatically switch to the NAV band screen which shows a CDI based on the received signal. The FTA-550 can store up to 200 Memory channels for quick and easy retrieval. With the capability of using up to 15 Alphanumeric characters per name the FTA-550 allows for a better channel description.